Welcome to the Puget Sound Marquetry Chapter for the Puget Sound area and the whole of Western/Eastern Washington. The closest other chapter is in the Potland/Vancouver area. Marquetry is an art form that uses only natural and dyed wood veneers for its presentation. It is a little known art form in America, but it is hundreds of years old as practiced elsewhere. In the United Kingdom and on the Eurpoean Continent, it is considered a "Fine art" and is practiced extensively. Every Marquetry picture is truly one of a kind. Beginning with the infinite stresses placed on a growing tree to the final slicing of the wood into veneers, each piece of veneer will never be duplicated again. 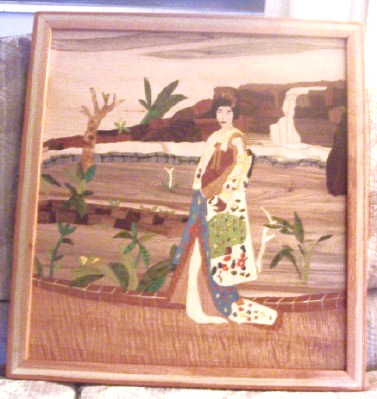 The award winning art work of marquetry is shown in the 2 pictures on this page. The above picture is titled "Lovers". It is about 24 inches square and required almost 6 months to complete. The Puget Sound Marquetry Chapter was formed to develop the art of Marquetry and make it more available to the general public. It does this by giving demonstartions, classes, and attending art shows. 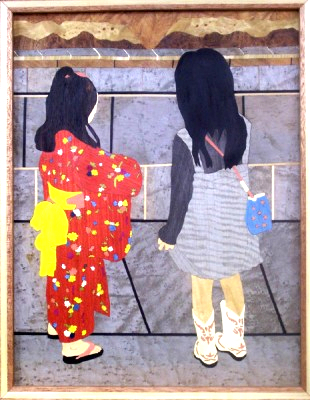 This picture is about 22 by 24 inches of 2 little girls at a recent Aki Matsuri. It is titled "East meets West." It is composed of only wood veneers with no paint used at all. Marquetry has sometimes been called painting with wood. The wood veneers are very thin and cut with a hand-held fret saw or medical scalpel.